It’s happened. Donald Trump has been inaugurated as US president. Promising to “put America first”, his isolationism, divisiveness and seeming-instability take him out of contention to be the “leader of the Free world”. Angela Merkel’s highly-qualified welcome when he was elected marks her out as having the courage and standing to hold him to account. Barack Obama left office with justifiably high approval ratings. Donald Trump comes in having lost the popular vote badly, and with poor and declining approval: for him, the honeymoon period is over even before it began. A brave woman is preparing to sue him for sexual harassment. We are in the surreal world where a wise and highly-experienced candidate who got more votes than him watched him be sworn in, knowing her campaign was damaged by false allegations that had her dubbed “crooked Hilary” while Trump has shaken off allegations that would finish most political careers and seems to have been facing a string of potential court cases, whose disappearance should raise an eyebrow. The inauguration was conspicously less well-attended than Obama’s. It’s been accompanied by an astonighing level of protest, not least from people standing up for women’s rights, horrified by his conduct. Friends working in mental health in the US are talking of the harm done to women in the US who have been sexually assaulted and now see a president against whom there are allegations of this sort, making them feel that sexual assault has suddenly become acceptable. I find myself suspecting that Barack Obama will slide gracefully into a Nelson Mandela role, as the wise elder statesman, whose example shows Trump’s flaws in stark contrast. She had the wisdom to welcome him, but qualify that by insisting on the sort of civilised western democratic values that he has been flouting. She speaks wisdom to power. In the absence of wisdom in the White House, her wisdom shines. And in Europe? The EU is not set up to invest power in one figure. It’s a wise balancing act, where authority moves to those who use it wisely, held in check by not drowing out others, and not needing to dominate. In that world Merkel shines. In the UK, people with short memories, shaped by war movies, equate Germany and Hitler. That’s unfair, and underestimates how easily the English could have headed down that path — the outpouring of xenophobia and migrant-hating following the EU referendum is a stark reminder of that. People with longer understanding will know that the German-speaking world was, for centuries, a complex web of states. For most of the eighteenth century, the King of England was one of the electors in that Holy Roman Empire (neither holy, Roman, nor an empire, but a precursor of the EU). Power was wielded by consensus and collaboration. Growing up in East Germany, Merkel could be forgiven for having been over-influenced by that repressive regime. Instead, she shows how deeply the consensual model is rooted in the German psyche. She’s reverted to type in an impressive way, with the wisdom to compromise and seek the common good. Of all the nations of Europe, Germany has suffered most from having been infected with the madness of facism and has the deepest reasons to say “Never again” and it is Angela Merkel, who now stands tall in the face of an unsavoury US President, signalling that there is another way. By contrast in the UK, we have Boris Johnson causing shock by drawing absurd and insulting parallels between Francois Hollande and a prison camp guard. We have Theresa May telling us what people voted for when they voted Leave, even when that contradicts what was being said in the campaign (for example, Daniel Hannan clearly saying leaving the EU didn’t mean leaving the single market). She has even managed immigrant bashing despite her years as Home Secretary, from which she will have learned that we actually need immigration (particularly if her recent plans for more GP services are to work). Merkel isn’t going to stand up and say “I am in charge”. Unlike Theresa May, she is not going to end up in court, trying to defend the side-lining of Parliament, or flagrantly ignoring well-informed advice. The centre of gravity has shifted already. And if the US becomes more isolationist and inward-looking, as Trump has suggested, then it is actively vacating any claim at world leadership. That’s no surprise, at 300 million, the population of the US is not much more than the difference between the populations of China (1323 million) and India (1130 million). The world is changing as they come into their own economic power. And for the much-smaller nations of Europe? On our own we are small-fry, perfectly able to enter trade deals, but only of the sort where China drafts and we sign. Together Europe is stronger. We have deeply-shared values and histories. The centres of gravity in Europe cluster around Angela Merkel, who in her turn shows the sort of pragmatic wisdom that delivers stability with diversity, enabling power to be devolved away from the centre. This is a less-aggressive model, which can cope with not being the world’s dominant power: it doesn’t need to “make America great again”. It can cope with national leaders begining one-among-many in the EU, and with the EU being among the world’s centres of power. Merkel navigates this brilliantly, modelling authority without dominance. Meanwhile the UK things have become horribly authoritarian. And in gendered language… The US sees a well-balanced man, clearly comfortable with women as equals, replaced by a president who is a parody of abusive dysfunctional masculinity. In the UK, Theresa May, like Margaret Thatcher, seems determined to be a domineering force that is also a parody of masculinity. But in Germany, Angela Merkel is a wise and respected Chancellor, who happens to be a woman, which seems to be no big deal. As well as standing up for western values of Liberty, democracy and fairness, the Germans are showing us something about gender relations — about being comfortable in one’s own skin, and therefore able to relate to others without needing to dominate. 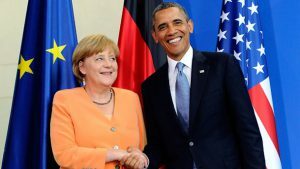 Time to welcome Angela Merkel to her new role as the one on whom pre-eminent leadership in the western world now sits. Postscript, 25 January: The Economist’s Democracy Index has downgraded the US to a “flawed democracy”: no longer in the top-20 well-functioning democracies worldwide. Let us hope that May shows Merkel-like qualities on Friday. Next Next post: The other side of Brexit: What about the Leavers?